Touted as the most detailed 3D rendering of ancient metropolis, Danila Loginov has presented his second promo of the ‘eternal city’ of Rome at its architectural peak, circa 320 AD (watch the first animated promo here). 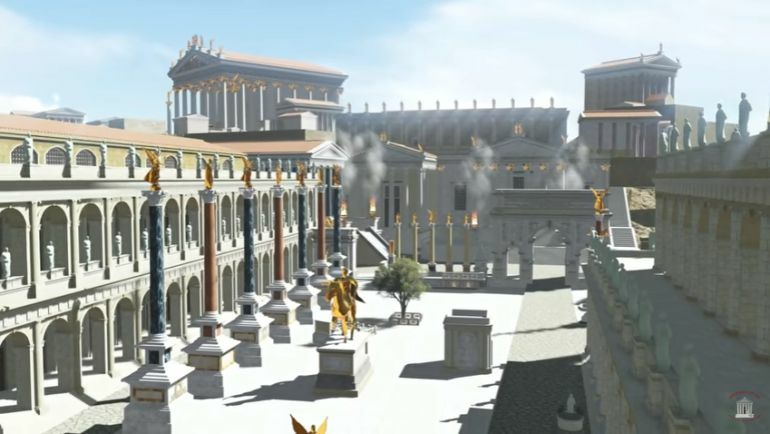 Running over 5 minutes of awesomeness, the animation video adds various ancient landmarks such as the temple of Divine Augustus, basilica Argentaria and a few other temples of the Capitoline hill. Now as for the significance of early 4th century in Rome’s (the city) history, the period mirrored wide-ranging political and religious upheavals in the capital. In many ways, this short epoch reflected the change from classical avenues to ‘Christianized’ scopes, especially with the rise of Constantine. And almost in an ironic manner, such changes brought about the last spurt of architectural achievements in ancient Rome itself – and these ‘church’ structures were complemented by the earlier incredible specimens built by the ‘pagan’ Romans. Simply put, most of what we know about ancient Rome in our modern age comes from this period, along with the glorious preceding years before the rise of Constantine. Unfortunately, by 410 AD, Rome unceremoniously lost its status as the administrative center of the western Roman realm, while Constantinople (now Istanbul) had already overtaken the ‘eternal city’ in terms of growth and influence in late 4th century. Interestingly, by virtue of its new found status as the wealthiest city in Europe, Constantinople was also called Nova Roma (Νέα Ῥώμη or ‘New Rome’), thus attesting to the power and prestige of original Rome in its imperial heyday.